Pro-Ject's Phono Box S phono preamp serves up the warm, relaxed sound that vinyl is famous for while offering unique performance enhancements rarely seen at this price. Its carefully selected amplifier modules and audiophile-grade components make your treasured record collection shine. No matter what kind of phono cartridge you mount on your turntable, this versatile preamp gives you a wide range of input settings to optimize its performance. A switchable subsonic filter protects your amplifier and speakers from power-wasting low-frequency rumble below 20Hz. The Phono Box S phono preamp is compatible with both moving magnet and moving coil cartridges, so you can count on proper matching with virtually any turntable and cartridge combination. Just what I was looking for to increase turntable volume. I was willing to pay more but my sales rep convinced me this is all I needed to compliment my NAD amplifier. Does this product have a mono audio setting, so that I can play and hear my mono records properly? It has some minor adjustments at the bottom part of this unit. But as it is on default, it would make your mono experience much enhanced compared to directly using your built in phono stage. 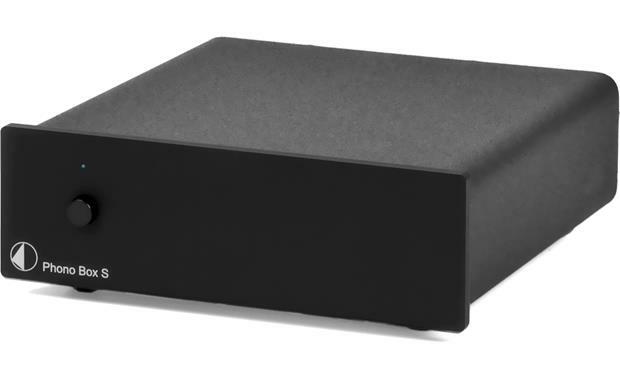 Phono (MM/MC) Preamp: The Pro-Ject Phono Box S allows you to connect a turntable with either a MM (moving magnet) or MC (moving coil) cartridge to today's home receiver's and amplifier which do not offer a dedicated phono input. There is a button on the back of the unit which allows you to switch between MM or MC mode. Metal Case: The Phono Box S's metal case shields the electronics from vibration and electromagnetic interference. Audiophile-Grade Capacitors: Carefully selected amplifier modules and audiophile-grade polypropylene capacitors make it possible to enjoy your valuable vinyl collection like never before. Dual-Mono Circuitry: The Phono Box S provides optimal channel separation through dual-mono circuitry and low-noise ICs. RIAA Equalization: The Pro-Ject Phono Box S provides amplification and RIAA equalization for both MM and MC cartridges. Controls: The Phono Box S features various controls to make sure your turntable sounds it best. Gain Levels: The phono preamp's gain level (40/43/60/63dB) can be adjusted to match the level of your MM/MC turntable. Input Impedance/Capacitance: You can adjust the phono preamp's input impedance (10/100/1000 Ohms) and input capacitance (100/200/320/420pF) to the setting that best suits your turntable. The input impedance is locked at 47k Ohms for MM turntables. Subsonic Filter: A switchable subsonic filter prevents your amplifier and speakers of ultra low rumble below 20Hz (-12dB). Connections: The Phono Box S features a stereo RCA input and output, as well as a ground terminal. RCA: The phono preamp features gold-plated stereo RCA connections. A stereo RCA input connects your turntable, and a stereo RCA output connects your home receiver or amplifier. RCA cables sold separately. Ground Terminal: The phone preamp also has a turntable ground, in case your turntable has a separate ground lead. This provides shielding to the tone-arm and the sensitive circuitry in the turntable. Outboard Power Supply: The Pro-Ject Phono Box S operates off of standard household AC current, using the supplied AC power adapter. The external power adapter is separate from the phono preamp to further improve sound quality. Technical correction to the answers by DAVID L G, RichinCA, PAUL CO A, MARK A: Your answers go to only one part of the issue, and avoid the inconvenient truth that the grooves on mono recordings are shaped differently, requiring a proper spherical stylus. So the real difference between "mono" and "stereo" isn't just the wiring (with left separate from right) or the cartridge output or even the phono stage/preamp, but actually goes to the shape of the stylus: To properly play mono, you will need a proper mono cartridge with a proper mono stylus (e.g., the Ortofon White, to name a modestly priced one). The reason you guys think using a stereo stylus on a mono record "sounds better" is that the elliptical shape of a stereo stylus rides lower down, in a virgin part of the groove, one which hasn't already been scraped by a spherical mono stylus during previous playings. Unfortunately you're still listening to the up and down plus left and right action of the stereo stylus, and not getting that true mono sound. No, it does not have a mono setting. The only mono component that I'm aware of, that can be added to a phono system, is a mono Turntable Cartridge. But it would have to be swapped into and out of the system, for Mono or Stereo. While there may be an advantage to having a dedicated Mono Cartridge for your system, I find the sound of the Phono Box S very satisfactory, when playing my Mono records. Some even seem to sound better than the Stereo version, even though their being played back on my Stereo equipment. No, there is no separate mono setting. Instead, there are R&L In and R&L Out, plus on/off for the subsonic filter. If your turntable has separate channel connections you should be OK, but if there's just one connector, then this probably wouldn't work for you without some kind of adapter. I have the manual in front of me, and these are the only connections described and illustrated. Now I have a few mono discs or tracks that play just fine through the stereo setup, so this is not an issue for me. How difficult was it to set up this unit? I have a Grado cartridge, and that manufacturer tells me to confine my adjustments to increasing the gain and not to reset impedance or other options. Isa that possible? How do you reset the Gain? Setup is very easy. I have not problems at all. This unit have 4 gain settings: 40 db, 43db, 60db and 63db in the bottom. It have 8 little switches. You set the gain with the first 3 of them(on/off). The diagrams are easy to follow. Setup is fairly simple. There are two banks of DIP switches on the bottom of the unit, one for each channel. Switches 1-3 control the gain, 4-6 the impedance, and 7-8 the capacitance. They all operate independently, and the settings are clearly given in the manual. For gain you can set 40 and 43db for moving magnet cartridges and 60 and 63 db for moving coil cartridges. On the back of the unit you have RCA inputs and outputs, a grounding lug, power connector, and push button to activate a subsonic filter. The unit uses 12v DC power, so there is an AC adaptor that keeps potential line noise away from the unit. I have been very pleased with my purchase. Sound quality is excellent.